COLUMBUS, Ohio (AP) — Campaigning in the neck-and-neck Ohio governor’s race continued to intensify Friday in the run-up to Tuesday’s election. 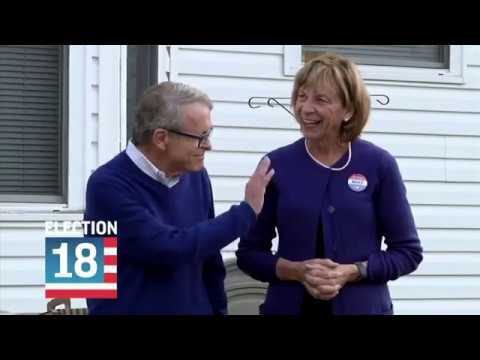 Republican contender Mike DeWine, the state attorney general, was banking on a get-out-the-vote boost Friday from Ohio Gov. John Kasich headed into the weekend. The governor’s support followed appearances by Vice President Mike Pence and Sen. Lindsey Graham. It came ahead of a planned Cleveland stop Monday by President Donald Trump, who Kasich has relentlessly criticized. Democrat Richard Cordray, 59, also sought to rev up voters headed into the final weekend with twin rallies Thursday by Massachusetts U.S. Sen. Elizabeth Warren at college campuses. Former Vice President Joe Biden returns to stump for Cordray, the Obama-era consumer protection chief, Saturday for the second time this week. Last-minute polling did little to predict a sure winner, with the candidates close. Democrats see Kasich’s departure due to term limits as an opening amid national energy moving in their favor. Republicans are banking on a ticket made up of familiar incumbents to win the closely divided state. DeWine, 71, is a former U.S. senator and lieutenant governor and one of the state’s most well-known politicians. His running mate, Jon Husted, is the secretary of state. The two were considered a Republican dream team at the start of the campaign, but their failure to secure a firm lead has led to optimism for Democrats and increasingly pointed advertising. One last-minute ad features a sexual assault victim critical of Cordray’s decision as Ohio attorney general not to pursue felony charges against her attackers. She was then 14 and the boys were 18 and 19. Cordray has said he tried to make the best decisions he could while holding the office. Cordray’s final ad blitz continued to hammer DeWine as an opponent of insurance protections for people with pre-existing conditions. His claim stems from DeWine joining the Republican lawsuit against the Affordable Care Act, which ensured such protections. DeWine insists he supports such protections. Kasich has cut a DeWine ad seeking to re-emphasize the point as health care polls as a key issue among 2018 voters.